USS Wayne E. Meyer (DDG 108) and USS America (LHA 6) departed from the Port of Los Angeles, Sept. 6, bringing the first Los Angeles Fleet Week to a close. 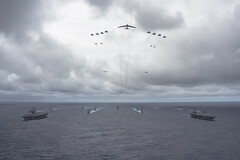 Forces from U.S. Pacific Command are scheduled to participate in Valiant Shield 2016, Sept. 12-23 on Guam and around the Marianas Island Range Complex. 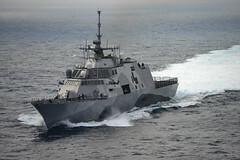 The littoral combat ship arrived in Guam Sept. 6 for a routine port visit while en route to its homeport in San Diego. 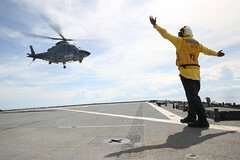 Navy and Coast Guard representatives from 11 countries came together for dialogue and information sharing during a Helicopter Operations from Ships other Than Aircraft Carriers (HOSTAC) conference in Singapore, Aug. 29 - Sept. 2. 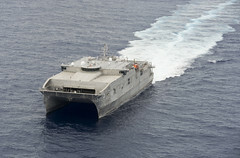 Navy Reservists and staff from Logistics Group Western Pacific and Military Sealift Command Far East operated watch stations aboard USNS Millinocket (T-EPF 3) Aug. 22 - Sept. 2 as part of exercise Ulchi Freedom Guardian. 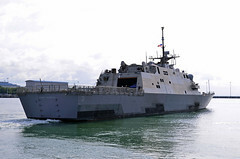 Vice Adm. Tom Rowden recently ordered an engineering stand down for every LCS crew to review procedures and standards for their engineering departments. 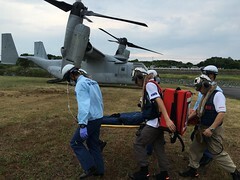 An MV-22 Osprey operating from the Bonhomme Richard Expeditionary Strike Group at sea transported medical personnel and evacuated a simulated patient from a remote island during Sasebo, Japan's annual emergency drill, Sept. 1. 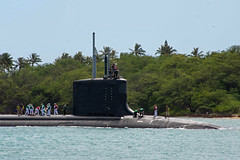 The Virginia-class fast attack submarine returned home to Joint Base Pearl Harbor-Hickam Sept. 1 following her maiden deployment to the Western Pacific. 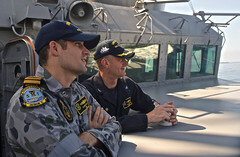 A Royal Australian Navy officer deployed with the inaugural U.S. 3rd Fleet Pacific Surface Action Group is helping enhance relations and build interoperability between the two navies. 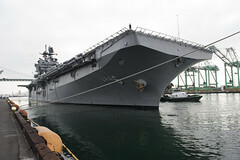 USS Wayne E. Meyer (DDG 108) and USS America (LHA 6) arrived at the Port of Los Angeles Aug. 30, kicking off the inaugural Los Angeles Fleet Week running through Sept. 5.